Title pretty much explains it, I'm looking for a simple way to get the RSSI signal from FrSky receivers onto my video signal. 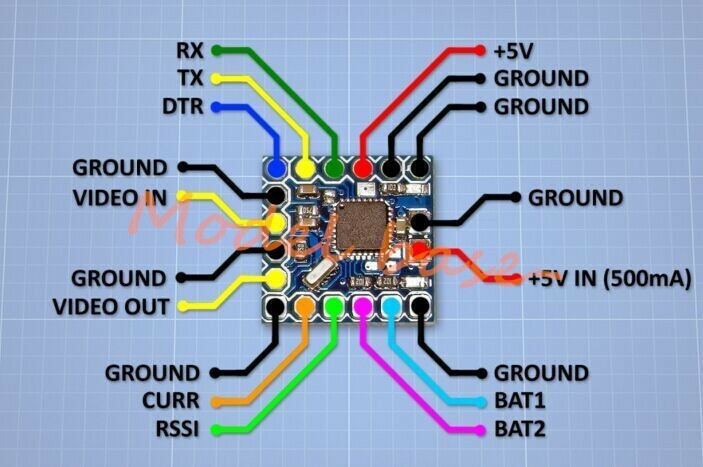 I've done it on one of my miniquads using the Betaflight F3 board and its built in OSD, but I'm looking for something to use on flying wings and quads with cheap fc's. Theres obviously no fc in a flying wing but I still want to be able to see my RSSI value. I'd also like to put it on other miniquads that don't have an fc as nice as the Betaflight F3; such as a Naze32, etc. TLDR: Need a way to show RSSI on OSD, not using an fc. Also needs to work on a wing. Could easily be done with a micro MinimOSD. They can do both standalone and FC supplied data. You can do battery voltage, current, RSSI, and even GPS if you wanted without the need for an FC.